Camping La Citadelle är en camping i Beaulieu-lès-Loches, Indre-et-Loire, belägen vid en flod/ en bäck. Campingen har platser med stängsel, med skugga och platser med lite skugga. Det finns möjlighet att hyra husbilar och bungalows. På campingen finns en lekplats. Denna inspektör gör varje år ett besök på Camping La Citadelle och inspekterar campingen för ca 200 faciliteter och för andra förekommande punkter. Inspektören är en medarbetare från ACSI och arbetar inte för campingen. Loche is a beautiful medieval town with lots to see and do. The campsite is well situated just a 10 minute walk from the town centre and facilities were great. Stopped for one night but ended up staying a week. This is a lovely campsite in an excellent location. It\'s and easy walk into Loches with its many interesting sites. There\'s also a lovely walk through parkland dotted with sculptures to Beaulieu les Loches. Our pitch was very large and set back from the roadway. Water points are not so plentiful and the sanitary facilities could be better. Only two male and two female toilets in our block and no hand washing facilities without going round the other side to the shower area. The swimming pools are excellent and we made good use of them. This site is in the perfect spot - lovely walk into the town - motorhomers traveling with dogs the vets is walking distance and the receptionist was very helpful and made the appointment for us. Huge l\'ecleric with easy parking for motorhomes just up the road - we called in on way back out to motorway - easy road on leaving the motorway. They do not give you free wifi if you are using ACSI card - the first time we have experienced this - give with one hand take with the other. Also it is a shame they do not think it worthy to open the snack bar when the site is two thirds full !!! The fully serviced pitches were a lovely size with plenty of shade - we were close to the pool and they do not switch the waterfall off overnight so if you are sleeping with windows open you can hear it all night!! The restaurant and bar were closed whilst we were there in May. With a ten minute walk into town it did not matter. the staff were very helpful and the site was perfectly clean and tidy. All the toilets and washing facilitates were cleaned regularly. Very clean, very well organised site with excellent staff. Pleasant walk into the city which is well worth a visit. If coming up from the south to avoid the city centre follow the main road round until you reach the roundabout with the big super market on it. There is a campsite sign on the roundabout. Location very good next to river and short walk to interesting town. Site quiet, preparing for end of season. Cafe closed but plenty in town. Mostly pensioners stopping for a few nights on way south. Pitches good and level, with balance of open/shade. Sanitations clean and satisfactory (supply your own paper). Fantastic heated indoor pool. Would recommend. No restaurant as advertised in Asci book which I felt was misleading. Showers had no hot water, outside toilets weren't very nice and the rubbish bins and recycling looked as if they had never been emptied all season. Only stayed 3 nights as so awful. The showers were not clean and had no hot water. The outside toilets were not great either. The bins and recycling were completely full of rubbish so much so that it was difficult to put ours in! We will not be visiting again. Stayed on site end of September, staff helpful and friendly, toilet/showers were kept adequately supplied with paper, but are a little unsure although relatively clean not sure exactly how much cleaning was being done day to day. Would however return. Vill du boka campingen Camping La Citadelle eller få mera information? Det går bra med nedanstående uppgifter eller via campingens webbsida. 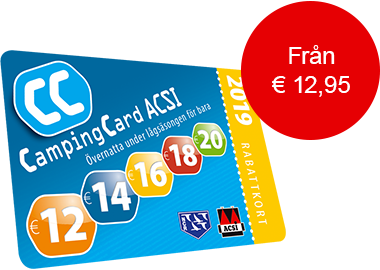 ACSI Eurocampings skickar din informationsförfrågan till "Camping La Citadelle".